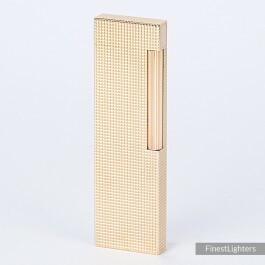 Beautiful ST Dupont Line 2 Table lighter from the 90's. The lighter is decorated with the iconic ST Dupont diamond head pattern. Gold finishing. Dimensions: 125 mm x 37 mm x 11 mm (4.92" Tall x 1.46" Wide x 0.43" Thick). Please note: the box has some damage and doesn't close properly (see pictures).